Terrorist group Islamic State earns millions of dollars selling oil on the black market in Turkey, Iraqi MP and former national security adviser, Mowaffak al Rubaie told RT. He also revealed that wounded terrorists are being treated in Turkish hospitals. “In the last eight months ISIS has managed to sell ... $800 million dollars worth of oil on the black market of Turkey. This is Iraqi oil and Syrian oil, carried by trucks from Iraq, from Syria through the borders to Turkey and sold ...[at] less than 50 percent of the international oil price,” Mowaffak al Rubaie said in an interview with RT. The Iraqi MP said there is “no shadow of a doubt” that the Turkish government knows about the oil smuggling operations. “The merchants, the businessmen [are buying oil] in the black market in Turkey under the noses – under the auspices if you like – of the Turkish intelligence agency and the Turkish security apparatus,” he said. “There is no terrorist organization which can stand alone, without a neighboring country helping it – in this case Turkey,” Rubaie said, urging Ankara to come clean and join the international efforts to destroy the terror group. Russia considers ISIS oil smuggling operations to be one of the highest priority targets in crippling the terror group’s finances and capabilities. Moscow has long been requesting that Ankara properly addresses reports of its alleged involvement with ISIS oil smuggling. President Putin himself noted that it was “hard to believe, but it is theoretically possible” that the Turkish leadership knows nothing about oil flowing into Turkey illegally. However he noted that the operations are too daring and obvious to ignore. 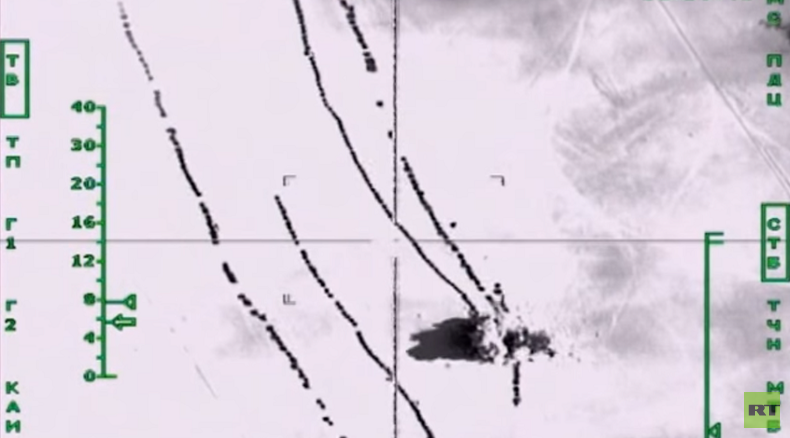 “Vehicles, carrying oil, lined up in a chain going beyond the horizon,” said Putin, comparing the views seen by Russian pilots and drones to a “living oil pipe” stretched from ISIS and rebel controlled areas of Syria into Turkey. “Day and night they are going to Turkey. Trucks always go there loaded, and back from there – empty,” Putin said earlier this week.